Ray Johnson grins broadly as he rubs the newly forged knife blade between his fingers. “I’m making tools the old-fashioned way,” he says explaining his passion for a dying art. Lucky for Johnson, he has an outlet for his talents. 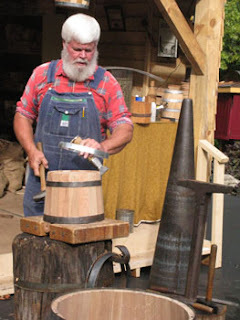 Known as the “knife-maker poet” at Silver Dollar City in Branson, Missouri, he gets to demonstrate his craft regularly. Once in a while he gets to recite his original poems for fascinated onlookers. 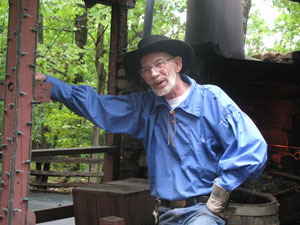 Retirees like Johnson are actively recruited at Silver Dollar City near Branson, Missouri. “Many older workers are looking for creativity they may not have had in previous jobs,” says Lisa Rau, Director of Public Relations for the park. “We love them because they have a good work ethic and they are loyal to the park and its ideals,” she adds. Granny Martha Sudweeks, dressed in prairie-style duds, stirs up bubbling batches of lye soap and extols virtues of the bars to anyone within listening range. 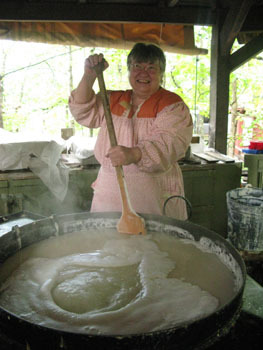 Although she has been making soap since her grandmother taught her how at age five, she has been cooking lye in her cauldron at Silver Dollar City for just five years. “We used to joke about working at Silver Dollar City, and here we are,” says Debbie Rury, who began a career as a jewelry maker after moving from Dallas a year and a half ago. Although her background is in fabric art, she now makes copper and silver jewelry in the studio of coppersmith Rex Morton. Keeping it all in the family, her husband Rob is apprenticing with Morton to learn skills needed for working with copper. Another couple who found post-retirement employment at Silver Dollar City are Claudia Hebing, who has been ladling hot wax into candle molds for two and a half years, and her husband, who works as a ride mechanic. Coming from Indiana, Claudia says they were drawn to Branson by the Southern hospitality and warm climate. She enjoys the challenge of creating beautiful and unusual candles, another art that’s become a curiosity in these times of look-alike manufactured goods. 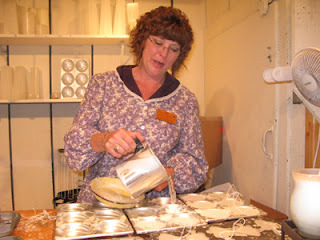 Other mature workers, many dressed in period costumes, can be found practicing old-fashioned trades at the candy factory, flour mill, foundry, and ice cream shop. 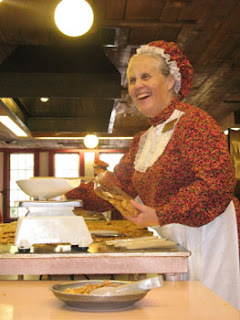 They love the work—at least according to all the older workers I talked with during a visit, and their patience, graciousness, and eagerness to share skills from by-gone days makes seniors valued employees at parks like Silver Dollar City.